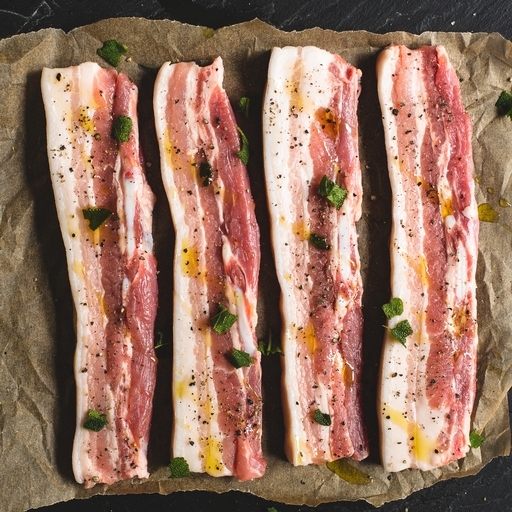 Fresh organic pork belly slices – fashionable for a good reason. Tender, tasty and rich, pork belly is a great-value, crowd-pleasing cut with many uses. Good for frying, barbecuing or in slow-cooked casseroles. The skin crackles beautifully too. Approximately 4 pork belly slices per pack. Season generously with salt and pepper and fry, griddle or BBQ for 10-15 mins until darkly golden and starting to crisp up. Or lay the slices on a baking tray and cook in a hot oven for 30-40 mins until golden. They will benefit from a final glaze with a soy-based marinade or some sticky BBQ sauce. Alternatively, you can dice and fry them as the base for a stew, cassoulet or batch of slow-cooked baked beans.